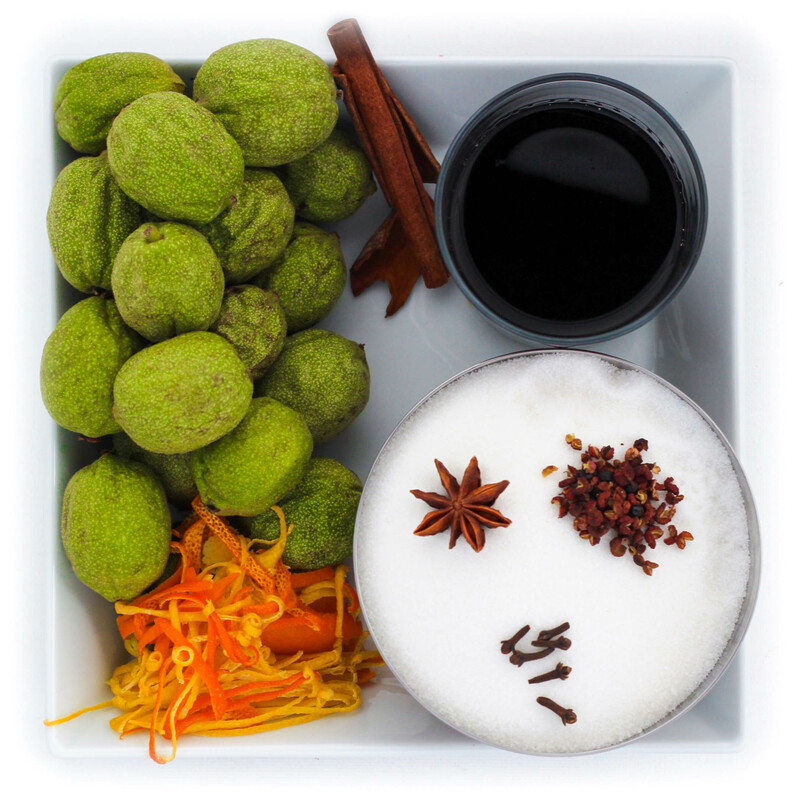 It’s green walnut season again… nope, it’s over. These things are only around for a few weeks, so grab them while you can. 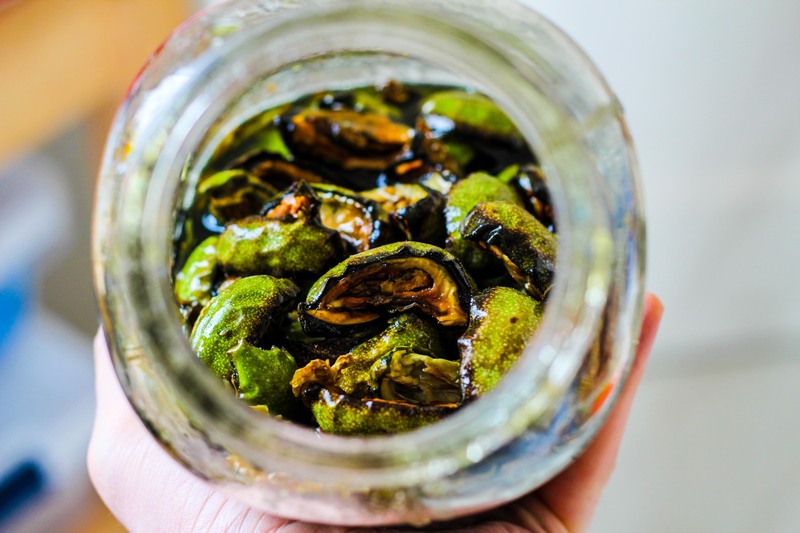 The last time I cranked out a significant batch of nocino was 2010, and I loved it, but my partner in crime at the time found the menthol and herbal flavors too intense (the term she used was medicinal), so this batch is a little warmer, sweeter and less herbal, but still true to tradition. 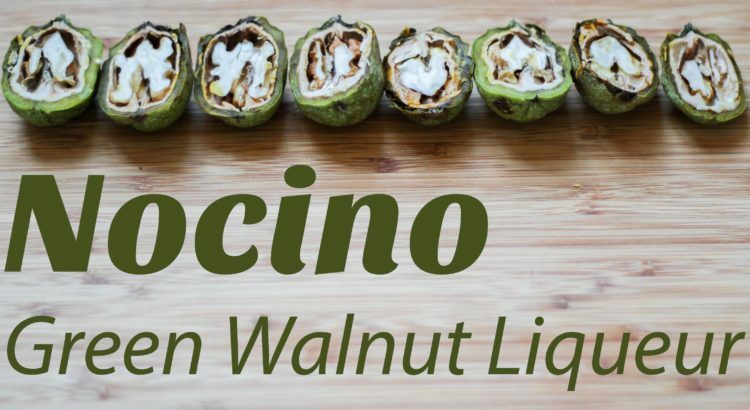 Five months is more than adequate maceration time, so if you’re already gearing up for Christmas presents, your nocino will be ready just in time. You will also find that it matures and flavors develop in the bottle for up to a year. 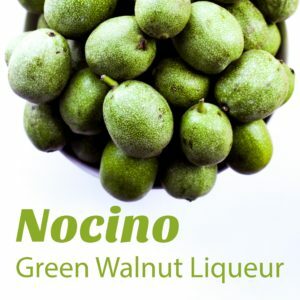 Nocino is a fantastic winter warmer, served chilled or over ice after dinner, but also works remarkably well in place of sweet vermouth in classic cocktail recipes and adds great flavor to hearty cold-weather desserts. I’ll post some recipes soon. 1. Combine walnuts, herbs and sugar in a glass jar, stir to coat, and set in a warm spot for two days. 2. Add the rest of the ingredients, cap tightly and give it a good shake. 3. Let your infusion sit for at least 4 months, or up to a year, shaking the jar weekly, if not daily. 4. Pour into a clean glass bottle through a coffee filter-lined funnel. This recipe yields over a liter, and makes fantastic holiday gifts, packaged in small bottles or flasks with a hand-made label and a couple of cocktail recipes. 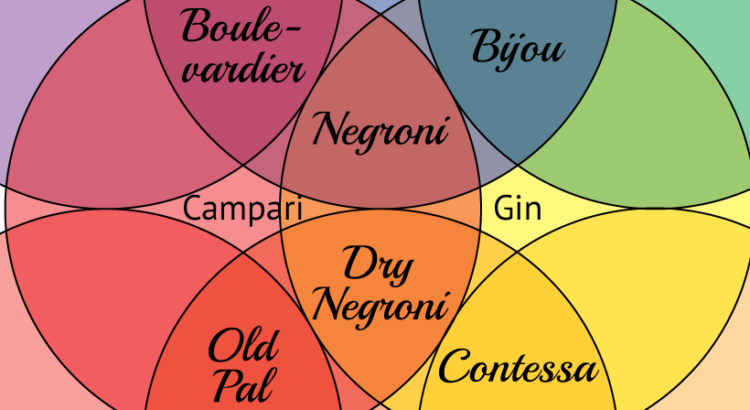 It doesn’t get much easier than this: equal measures of three ingredients to make these six fantastic cocktails from only eight bottles – and now I have an excuse to make a new Venn Diagram (here is last week’s). Stir ingredients with ice and strain into a chilled cocktail glass or an old fashioned glass with a big cube of ice. Garnish with an orange twist. 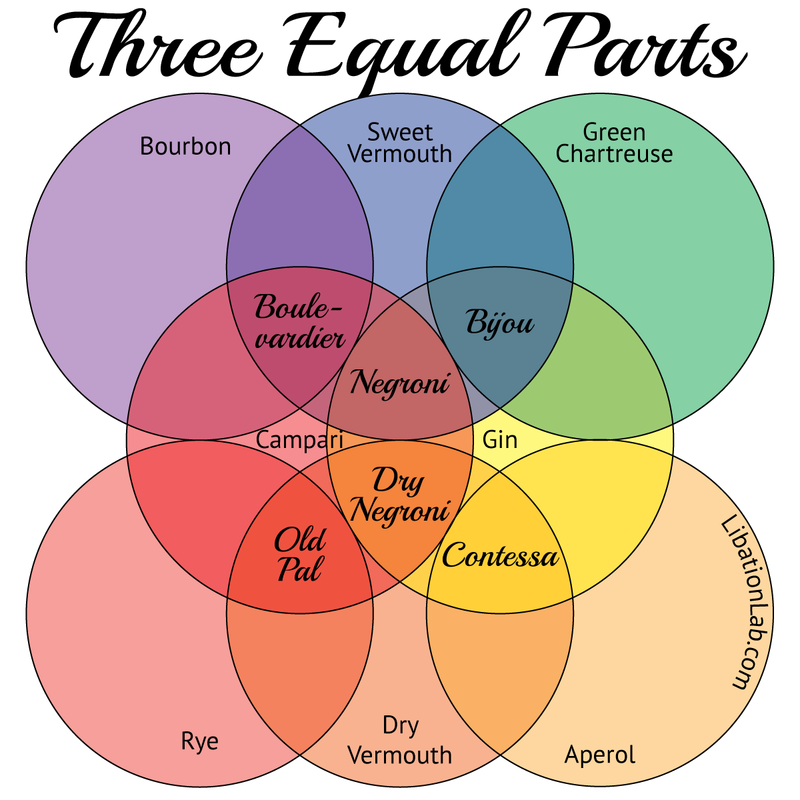 It doesn’t get much easier than this: equal measures of three ingredients to make these four fantastic cocktails from only six bottles – and now I have an excuse to make a Venn Diagram. 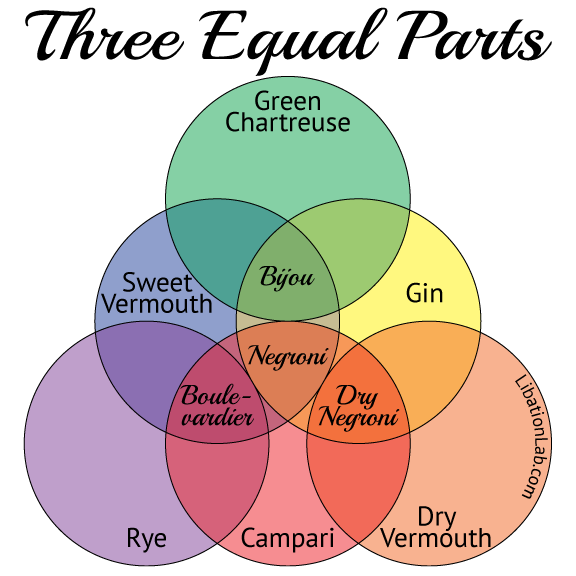 Note: This has been updated since it was pointed out to me that, despite my preference, a bijou is made with sweet vermouth and not dry, so in reconfiguring my original design (below), and I dropped the Vieux Carré, which was a stretch on the theme, but also delicious without the benedictine, bitters or lemon twist. 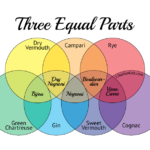 If you’re wondering how to use them, you can start off by replacing the Angostura, orange or Peychaud’s bitters in most any classic cocktail, and here are three excellent drink recipes (1 strong, 1 light and 1 bowl of punch) for each of the flavors I offer. At Tales of the Cocktail, I went to a session on Mixologists and their Toys, and after the first two presenters both talked at length on making sodium alginate sphericals (clearly they didn’t coordinate), the 3rd presenter demonstrated his new cocktail carbonating invention, the Perlini. During the Q&A I grabbed the mic and asked why you couldn’t do the same thing with a soda siphon, which has been around since the 1850’s. Well, everyone must love a smartass, because without knowing who I was, the VP of iSi walked over two minutes later, placed her card in front of me and told me to drop her a line so she could send me one. In December, I mentioned that I had all sorts of plans for soda siphon experiments, but I lacked the equipment at the time and so it slipped my mind, but I am back at it now that my shipment has arrived and iSi makes the best product I have tried. I hate anything ending in -tini that isn’t an actual martini, but why not just pour your gin into the siphon and carbonate it before adding it to a vermouth laced glass? Just because your drink is flat, it doesn’t mean the garnish needs to be. I loaded a batch of fresh pineapple chunks into the whipper with a CO2 cartridge, and when I had expelled the resulting pineapple foam and unscrewed the cap, the fruit inside was actually effervescent! I am sure I will be doing more with this in the near future, but for now, I want to relate what I have been up to so far. 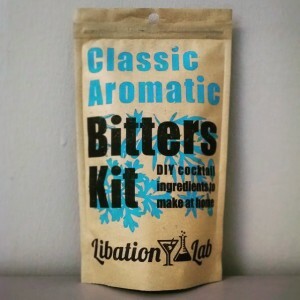 The impetus for launching LibationLab came from my experience in New Orleans a few weeks ago, at Tales of the Cocktail. “Tales” is the preeminent cocktail event in the nation, and probably the biggest convention of bartenders in the world. With press credentials secured based on my existing food and beverage blog, I went out to NoLa not knowing what to expect, but friends in the bartending community insisted that it was the highlight of their year. Tuesday, my fake sister and I rolled into New Orleans early evening, checked into the Hotel Monetleone, grabbed a Sazerac at the Carousel Bar and then dinner at Gumbo Shop. From there, we went to the first party of the week, hosted by the monks of Chartreuse (or at least their representatives supervising a staff dressed as monks). The party was quiet from start to finish, we met a few good people, sampled a variety of cocktails and called it a night. I had reaffirmed my love of Chartreuse, but still had no idea what lay ahead of me. The next day was a blur of tastings, seminars and socializing followed by a jaunt to the bad part of town (apparently a bartender here was shot in the back on the way out of work the week before) for a party at Bar Tonique hosted by the good people of Don Q Rum, then out onto Bourbon St. with my new crew. We hit Yo Mama’s for dinner, where I feasted on the Peanut Butter Burger recommended by my amazing bartender/soulmate. The best trick of the night: she had rigged the jukebox to play a different song, should a rube like me choose to play “When The Leavy Breaks” by Led Zeppelin. Although the seminars and events varied in theme, style and content, the consistent threads running through the week were humor and camaraderie. I was really impressed by the sense of community in the bartending industry, and with the new friends I made, we are already planning our return to Tales of the Cocktail in 2010. Note: all of the links on New Orleans business names are tied to my bar and restaurant reviews. 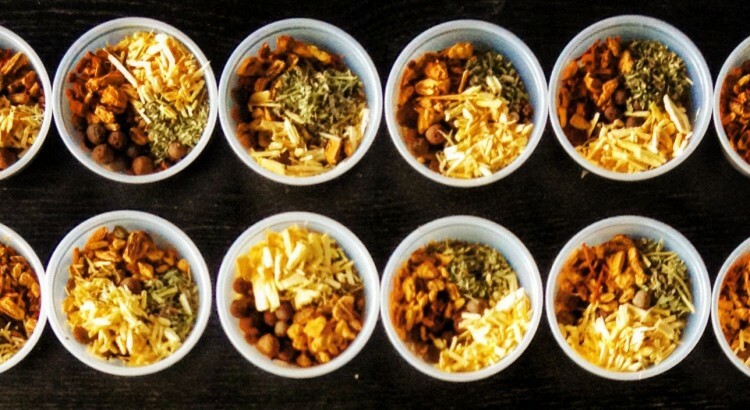 If you want a deeper understanding of what I experienced at each location, click away.